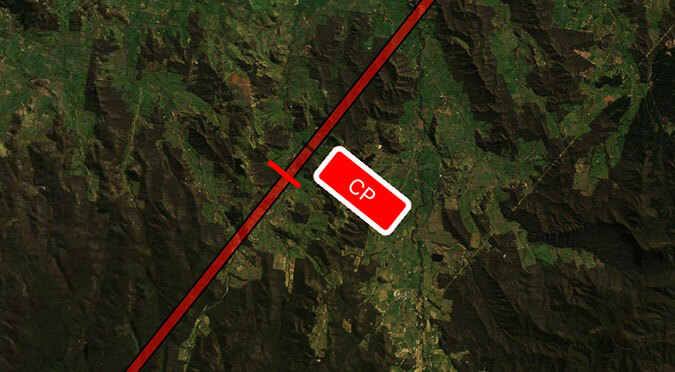 Eagle-eyed PRO Upgrade subscribers may have noticed a new Route Annotation popping up along their flight plan. It’s a little sign saying CP. What’s it all about, and why should we be interested? CP stands for Critical Point, or as it’s also referred to – equal time point. It’s the point along the route, when taking into consideration TAS and forecast winds that it will take the same amount of time to proceed to your destination as it would to about-turn and fly back to your departure airport. Note that this point is not the half-way point in your flight plan by mileage, and is not fixed – it may change when flying the same route from day to day. Different wind situations will change this point. For example, if you have a strong forecast headwind all the way to your destination, the Critical Point will sit much closer to your destination than to home. One critical point is ok for unpressurised single-engine aircraft… But what if you also need to consider emergency situations in twin-engine or pressurised aircraft? 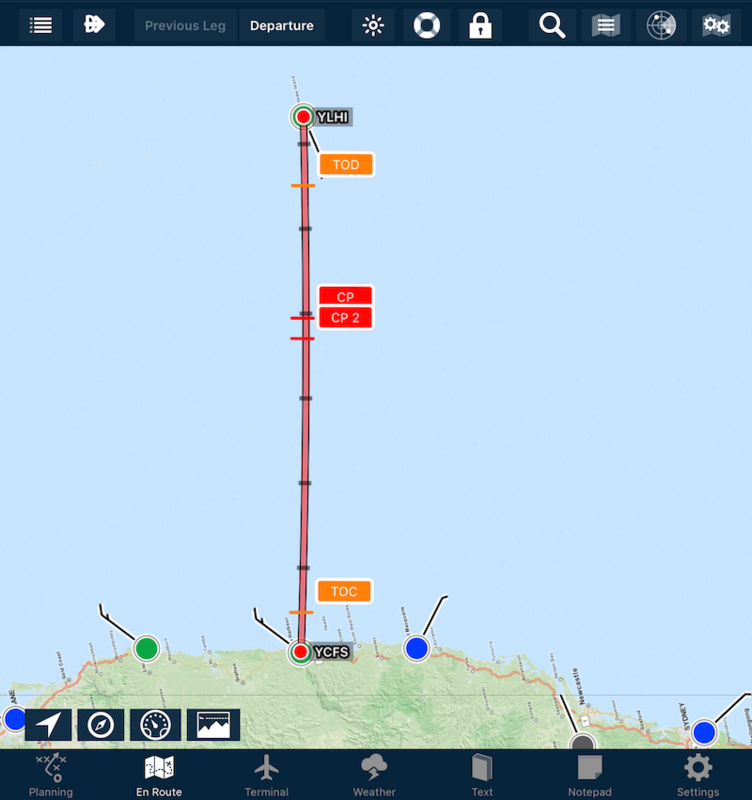 Now, you can have the critical point calculated for normal cruise, and a reduced speed cruise scenario. For example, it could be single engine performance for a twin, or a lower-level depressurised cruise for a turbine aircraft. You’ll see CP, plus CP 2 at another point along the route. To set the dual calculations up, simply work out what your reduced TAS would be. 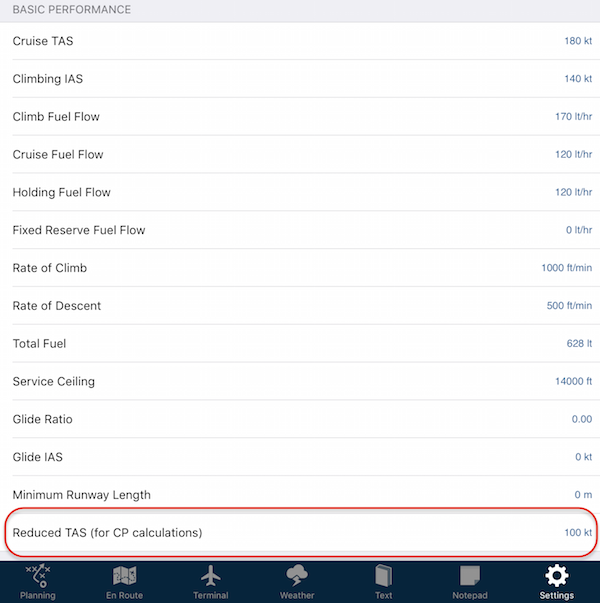 Tap Settings > Aircraft Type Database > [your type] > Basic Performance. Scroll to the bottom of the list – second from the bottom, you will see ‘Reduced TAS (for CP calculations)’. Tap in that field, enter your reduced TAS and tap the return key. Tap the back button (top left of screen: ” < ” symbol) two to three times, until you are prompted to save your changes. Making sure to select Save. 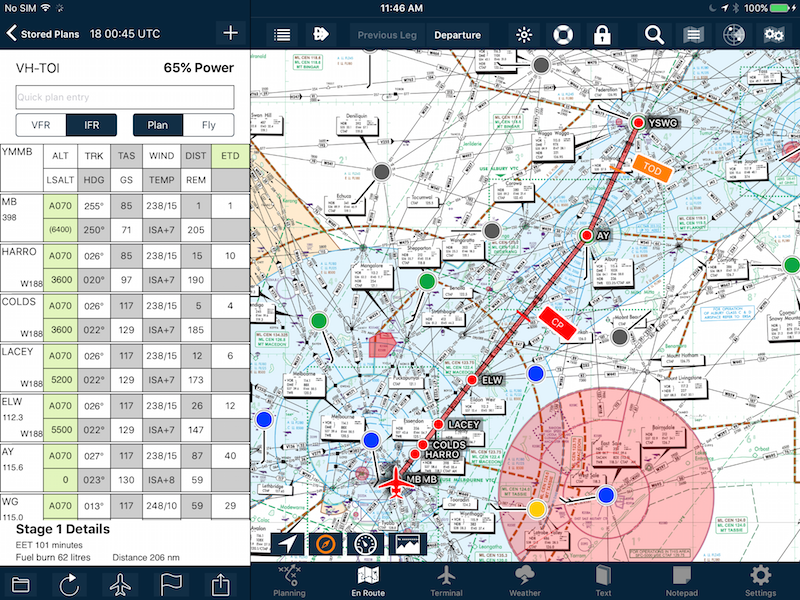 Now, when you flight plan with that aircraft you should see CP and CP 2 a little further along. CP being the ‘normal cruise’ and CP 2 being the ‘abnormal situation’ calculation. If you have entered a Reduced TAS accidentally and no longer need the two CP calculations, simply set it to zero and it will return to the single CP.